After his trial, the soldiers led Jesus to be crucified. Along the road to Golgotha, they met a man of Cyrene who was called Simon. Him they compelled to carry Jesus’ cross. Those who were passing by jested at Jesus. They said if Jesus said he was going to destroy the Temple and rebuild it in three days, then he should save himself by coming down from the cross. The Chief Priests, Scribes and the elders also mocked Jesus. They said that if Jesus was really the son of God, then he should come down from the cross and they would believe him. One of the two robbers, who were crucified with Jesus, also mocked him by saying he should save himself and save them too. The other robber however said Jesus was punished for doing nothing but they were punished because they had broken the law. Then he asked Jesus to remember him in his kingdom. That very hour Jesus fulfilled his request. From the sixth hour to the ninth, there was total darkness over the area. At a point, Jesus cried out saying, “Eli, Eli, lama sabachthani.” meaning, “My God, my God, why has thou forsaken me.” When bystanders heard this, they said Jesus was calling Elijah. They decided to wait and see if Elijah was going to really come and save him. One of them dipped a sponge in vinegar, hanged it on a reed and gave it to Jesus. Jesus cried out with a loud voice and gave up his spirit. There were several women who had followed Jesus from Galilee and who ministered to him. These women were standing afar and looked on while all these were happening. They included Mary Magdalene and Mary, the mother of James and Joseph and the mother of the sons of Zebedee. 1. As Christians, problems are bound to have problems but they must persist. 2. Christians must pray for their enemies. 3. Christians must be willing to forgive others. 4. There is hope for a repentant soul. 5. Christians must always remember that there is life after death. 6. Christians must commit themselves to God in all situations. 1. a. Trace Matthew’s account of the crucifixion of Jesus. b. In which three other ways are death sentences carried out in modern days? 2. Describe the crucifixion of Jesus in Golgotha, according to Matthew. 3. a. Discuss the crucifixion of Jesus Christ. b. 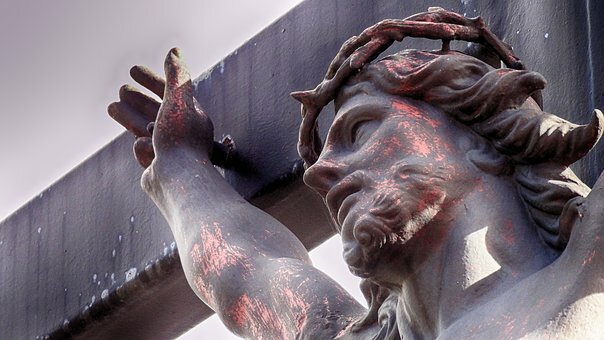 What two lessons can Christians learn from Jesus’ words on the cross?